With a 11-quart capacity, this juicer steamer offers plenty of room for high-volume juicing, Simply add fresh fruit in the top container, fill the bottom container with water, and bring to a boil on the stove top. The resulting steam gently extracts the juice, which drips into the center pan where it can be collected from the surgical-quality tube. Drink the vitamin-rich juice fresh, or save it for making jelly or syrup. 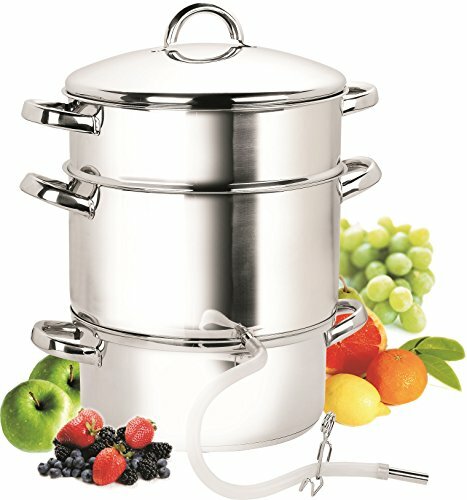 Without the center pan and tube, the juicer steamer can also be used to steam vegetables on the stove top. Ruggedly built, the juicer steamer features gleaming stainless-steel construction with a bottom that consists of a layer of aluminum sandwiched between two layers of stainless steel for fast, even heat distribution. Side loop handles on each of the three vessels help ensure safe, secure transport, and its secure-fitting lid with a loop handle helps keep in heat, moisture, and nutrients. Instructions and a recipe book come included.